Russia will mourn victims of the terrorist attacks in the Moscow metro on March 30, 2010. The Moscow government provides medical aid to all those who suffered in the terrorist acts regardless of the place of their permanent residence, officials said. Relatives of the victims will receive 150,000 rubles ($5,000) of compensation, a source at the Moscow government said. President Medvedev ordered the government to provide all necessary help to the families of those people who were either killed or seriously injured in the latest attacks. Two explosions rocked the Moscow subway on Monday morning, during the rush hour. 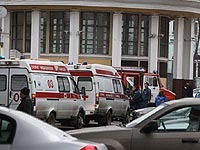 Thirty-seven people were killed on Monday morning as a result of two explosions in the Moscow metro. About 60 people were injured, at least ten of them are in critical condition. President Medvedev said the control over security at transport should be strengthened. “It is obvious that such acts are meticulously planned. They are conducted to destabilize the situation in the country and in the society,” Medvedev said. “We will continue the course of our struggle against terrorism. We will undoubtedly continue the operations against terrorism,” he said. Russia’s Federal Security Service believes that the suicide terrorists exploded hexogen bombs. The explosions were prepared and conducted by natives of the Northern Caucasus. The power of the explosion at the Lubyanka metro station was equal to 4 kilos of TNT. The second explosion at the Park Kultury station was less powerful – 2 kilos of TNT. The bombs were stuffed with pieces of metal and screw-bolts. The explosion at Lubyanka left 24 killed and 39 injured. Thirteen people were killed and over 30 injured in the second explosion at the Park Kultury station of the Moscow metro.